My childhood friend Brad and his wife Donna arrived Wednesday with their two children, E and C.
We’ve been running around the city and surrounding area, seeing as many sights as we can while keeping in mind that jet lag can be especially disorienting for children. The first evening we were out at dinner and E and C both fell asleep at the table. It was all we could do to wake them up so we could take them back to the hotel. As I mentioned in my last entry, I prepared a series of activities for E and C designed around a top secret agent/spy theme. When they checked in at the hotel, the clerk gave them a folder with their names on it with “Top Secret” stamped on it. They opened it to discover a mission overview and their Day 1 assignment. You have been selected for an elite mission.This mission is strictly top secret, although you can use your parental units to support your mission objectives, if needed. Your goal is to gather intelligence about the language, culture, transportation, and markets in the Kingdom of Thailand and send it to the headquarters of the United States National Geospatial-Intelligence Agency, or USNGIA for short. It turns out that the USNGIA is real but I went ahead and used them since their cool looking logo is readily available on Google. Agents E and C were assigned Thai cover names: Pi Chai (Big Brother) and Nong Saao (Little Sister), respectively. Agents Pi Chai and Nong Saao had an initial assignment that involved looking at a map, located their hotel, and answering a few questions about the surrounding area: Where is the nearest park? What is the name of the street their hotel is on? Etc. Their assignment for day 1 was to learn a few words of Thai, which Agent Nong Saao had already done as part of a school report she did on Thailand last year. “Yes”, “No”, “Hello”, and “Thank You” were enough to prepare them for their visit… er, secret mission. Your assignment is to gather intelligence about the culture of Thailand and to report it back to headquarters.Complete the following information and include it in your report. 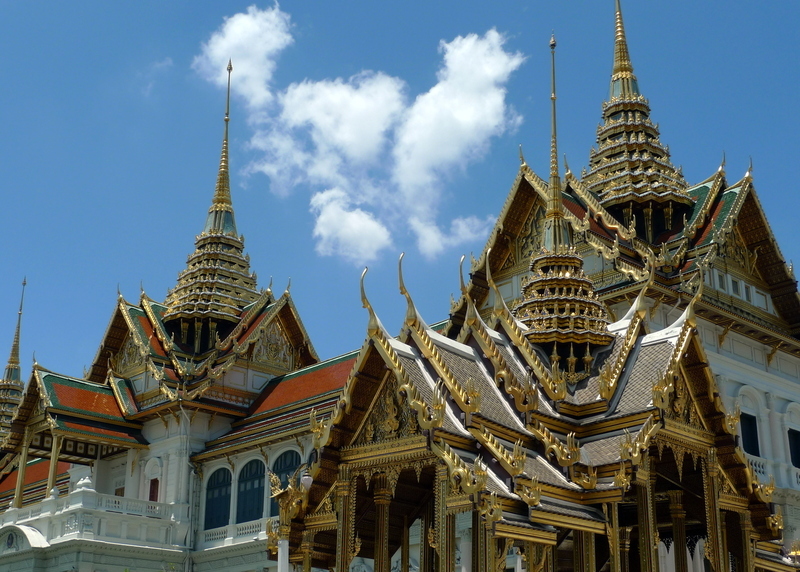 Your destination Thursday is the most important cultural and religious site in Thailand.It is a complex of buildings on the eastern bank of the Chao Phraya River in Bangkok. It served as the official residence of the Kings of Thailand from the 18th century onwards.It is also where the Temple of the Emerald Buddha is housed, the most holy Buddha statue in Thailand. 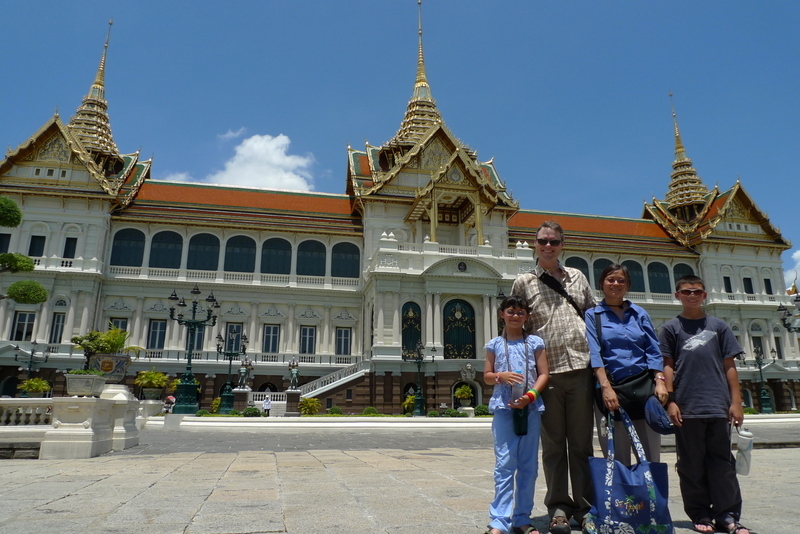 There was a word-scramble (er… “code to break”) that listed the name of the destination: The Grand Palace and the Temple of the Emerald Buddha. 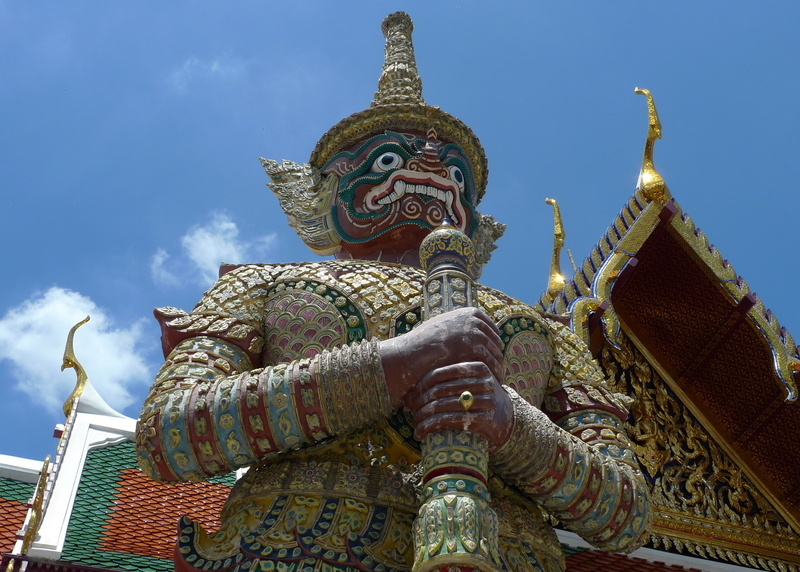 As part of the assignment, they used pictures to identify some of the mythical creatures represented on the grounds of the Grand Palace and the Temple of the Emerald Buddha. By asking questions of their guide and listening carefully, they would learn what all these creatures were and what they represent. 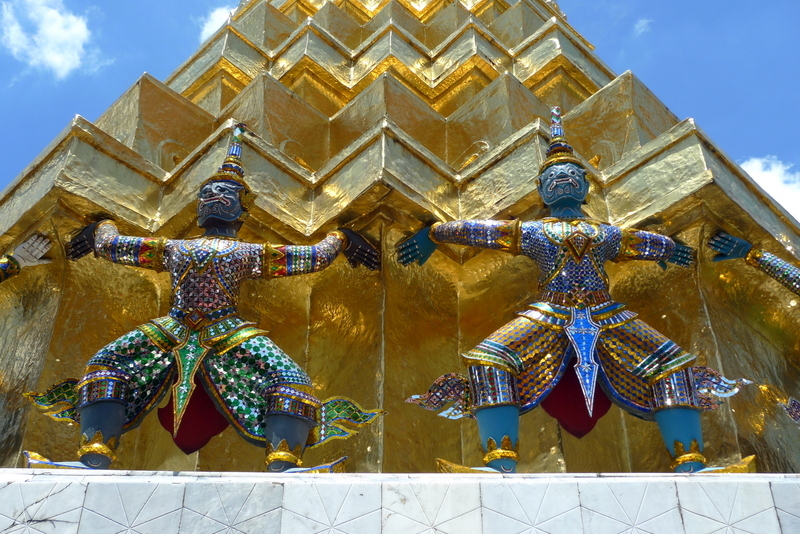 The creatures include the ones holding this golden chedi, or stupa, above, as well as the towering giants like the one below, that protect the entrances to the temple. Another two mythical creatures they needed to learn about were the garuda – the bird-man holding snakes in the center of the above photo, and the multi-headed snake called a naga, which line the edges of the roofs of temples and palatial buildings. 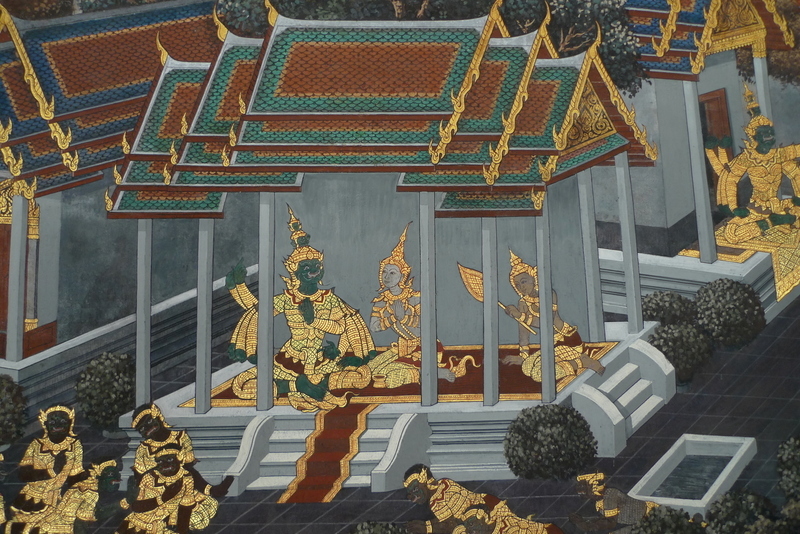 We saw these mythical creatures represented again and again, such as in these temple murals. 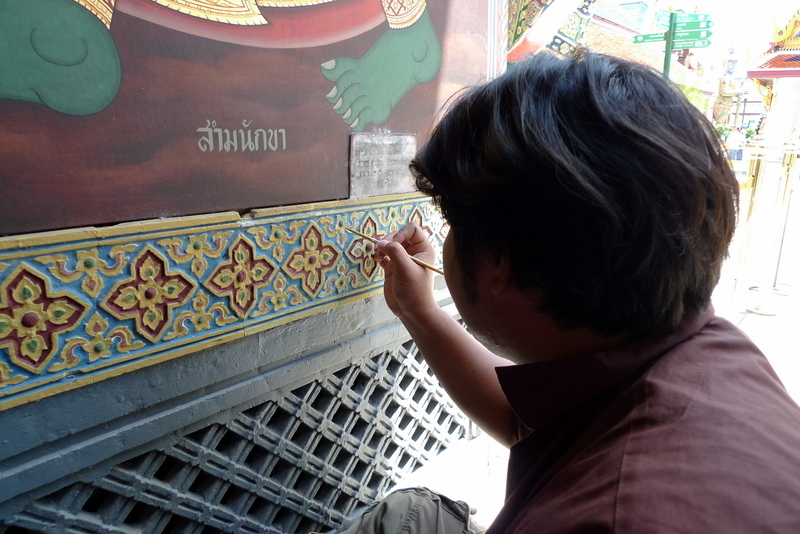 We also saw an artist attending to the fine details of the temple, keeping the paint fresh and bright. 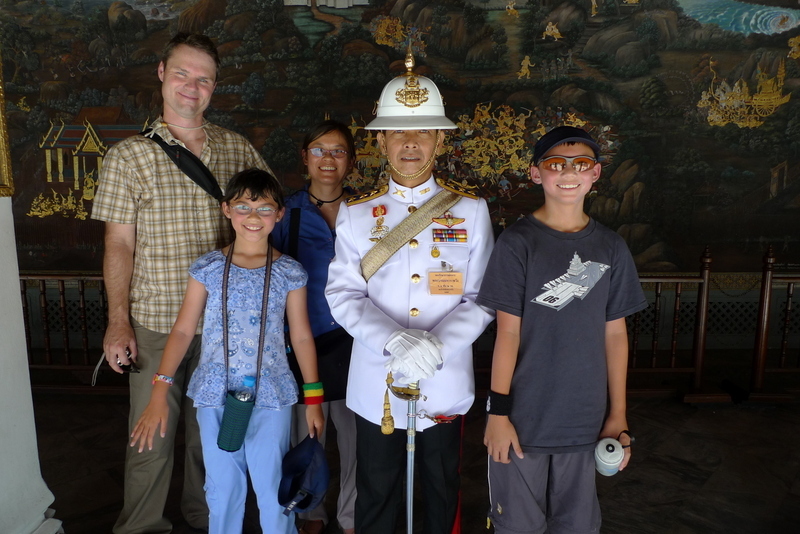 The Clevelands posting with a royal guard at the Temple of the Emerald Buddha. Does the cloud in this picture look like a chicken? Tail on the left, head on the right, with two claws on the bottom. I think it does and even though I didn’t tag the photo as a chicken, when I uploaded it to Xanga, the Google ad at the top of the screen was for a company that will help you grow your own chickens in the backyard. It’s a sign, I tell you! We saw the changing of the guards, who must be very hot in those outfits! As the secret agents and their parents started to wilt under the strong sun and high heat, we wrapped up our Day 2 assignment, headed out for some lunch at a nearby air conditioned restaurant, and then took the boat back down the river to the hotel for some swimming… and to await Day 3’s assignment! This entry was posted in Uncategorized and tagged Bangkok, Clevelands, Emerald Buddha, Garuda, Giant, Grand Palace, Khrungthep, Naga, Temple, Thailand, Visitors, Wat Phra Gaew by christao408. Bookmark the permalink. Chris, what a great idea for the kids!! It’s also great to see Brad’s bigger than life smile on your blog 🙂 You need to keep us all posted on kids’ mission. This is wonderfully imaginative — a great way to keep kids interested in a tour that I expect was as interesting to their parents as well! Thanks for sharing it with us too! what a great idea to those who have kids traveling along…. The children must adore you Chris. 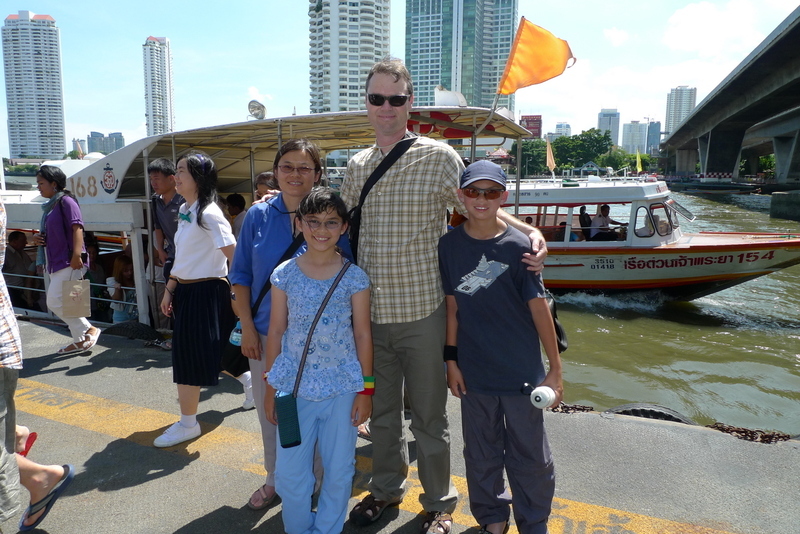 This was a wonderful way to get them into the thick of things in Bangkok. Great idea … and beautiful pix! Haha~seeing the two kids reminded me about your FB posting regarding jetlagged teenagers dozing off! 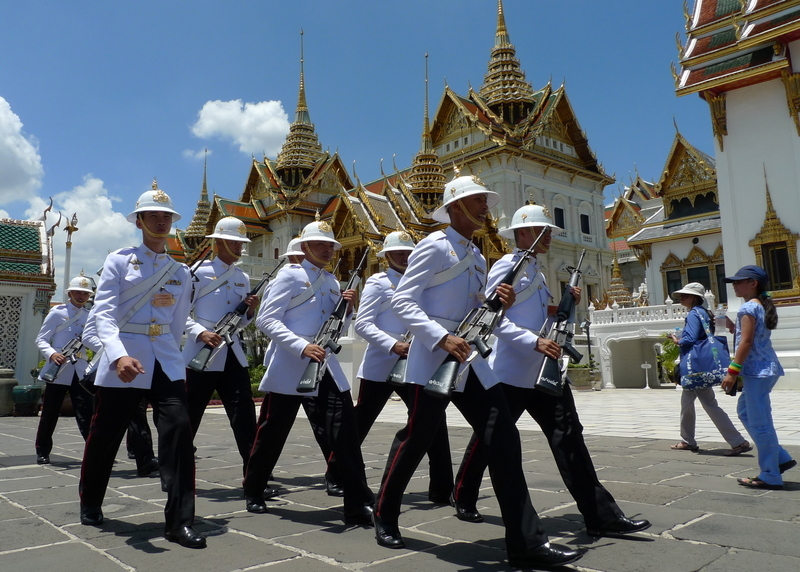 The Grand Palace is always a good place to catch the splendid side of Khrungthep. I had so much fond memories there and I miss that place! What a fantastic idea for the kids! I know that you are really enjoying having them visit. Please tell them that I said “Hello!” I cant wait to read more about the secret agents. That is so nice of you arranging specials for the kids. Almost like reading MI. Glad we could come along for the ride. Agent Steve reporting, and eagerly waiting for our instruction for day 3. hehe. That is absolutely so creative and I’m sure they will remember this trip for a very long time. This is so creative and engaging of you- the kids must adore you! Hello from us to the Clevelands, as well. The secret agent idea will keep everyone on their toes and help focus the sight-seeing. Keep this in mind for our anniversary visit. What a thoughtful thing to do for the kids! And a great educational and fun experience too. And Looking at the pictures, I just had one thought:Man, I need to visit the beautiful Kingdom of Thailand!!! @arrian_strider – @jandsschultz – @Chatamanda – @Redlegsix – @Dezinerdreams – @ElusiveWords – @stevew918 – @oldpartner – @CurryPuffy – @secade – @Senlin – @Passionflwr86 – @ZSA_MD – @agmhkg – @slmret – @deedee8370 – Thanks to everyone for your kind comments. Have been having a fun and busy time with the Clevelands, although Agent C thinks I’ve compromised their missing by writing about it on my blog. I’ll include the next part of the story in the next hour or so. Stay tuned! I do believe you are a natural teacher -making learning fun! @murisopsis – Well, I don’t know about that but I’ve had some experience in how to package lessons. @TheCheshireGrins – Maybe I’m just creating something I wish I’d had when I went on childhood vacations! @rudyhou – Let’s see… what’s changed since then? New paint. 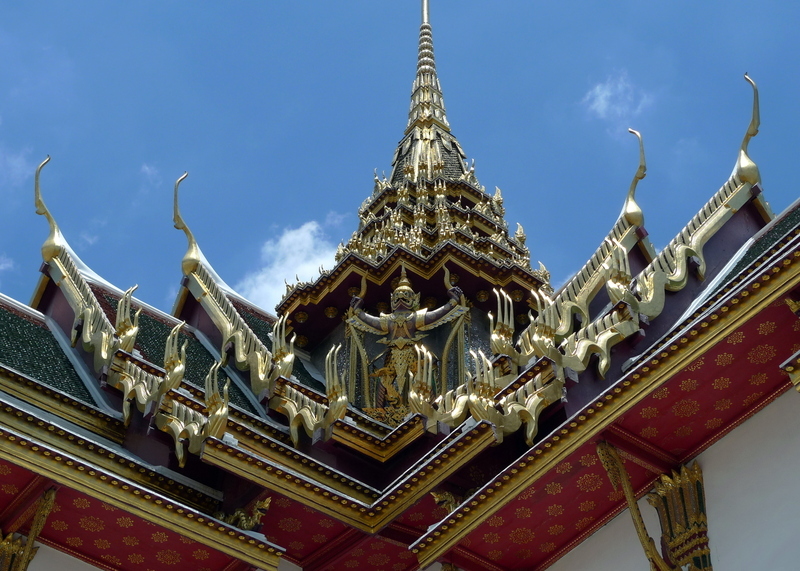 New roof on the building that houses the Emerald Buddha. Don’t know if they had the self-paced audio tours in 1999. Other than that, quite similar. i don’t remember whether or not they had the audio tours. i didn’t even look for it. i was more interested in what i could capture on my camera than the stories behind the beautiful buildings. plus, i only had about an hour so i had to speed up my walk.